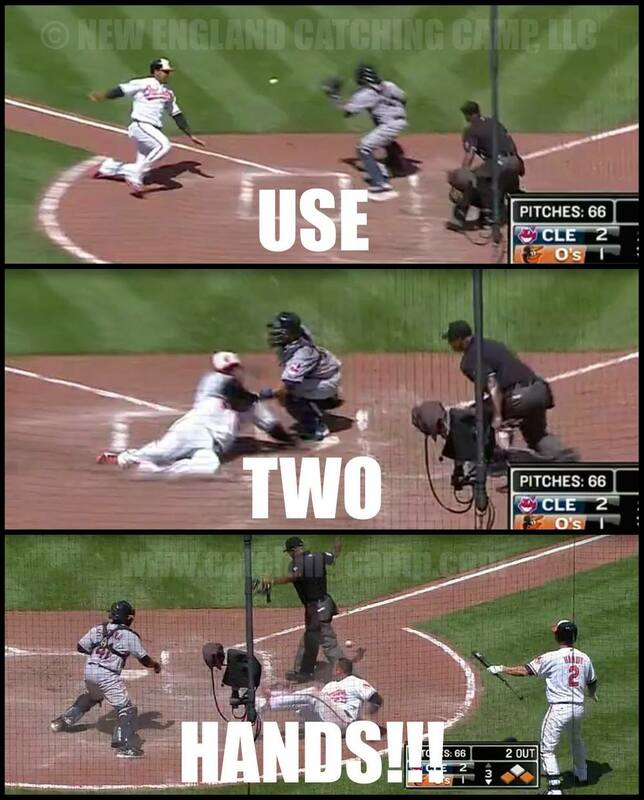 Catcher Meme #30: Use Two Hands! In today's Indians/Orioles game, Indians' catcher Carlos Santana had a perfect opportunity to record an inning-ending out at home plate after a great throw by Indians' OF Michael Brantley, but because he tried to make this tag with just his glove, the ball was knocked free on a relatively innocent hook-slide by Orioles' OF Nelson Cruz. There is absolutely no reason this shouldn't have been an out. Immediately after catching the ball, secure the ball with all five fingers of your throwing hand. Keeping the hands together and then make the tag. Had Carlos Santana used this approach, the score and possibly the outcome of this game may have been different. Catcher Meme #29: It's Out Hunting Season!